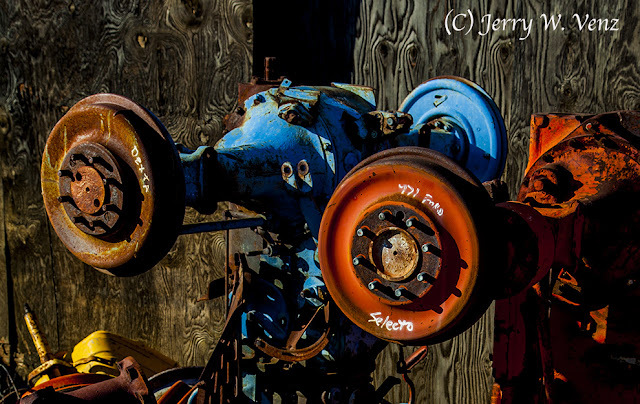 Photographers just love old, rusted, weathered things. I’m no different—I’ve always been drawn to old decaying artifacts wether they be man made—like cemeteries, junkyards, ghost towns—or natural made like the slowly eroding sand stone structures in Canyon Lands and Arches National Park or the ancient bristlecones or Jeffery Pine trees in the west or the ultimate in weathered erosion the Grand Canyon. These things draw us like moths to a flame! I used very directional, direct sunlight, to pick up detail and texture and create shadows to show three-dimensionality. I love this scene because of the primary color contrast of these tractor differentials. I moved my camera position to the right to Layer the red one against the blue one. 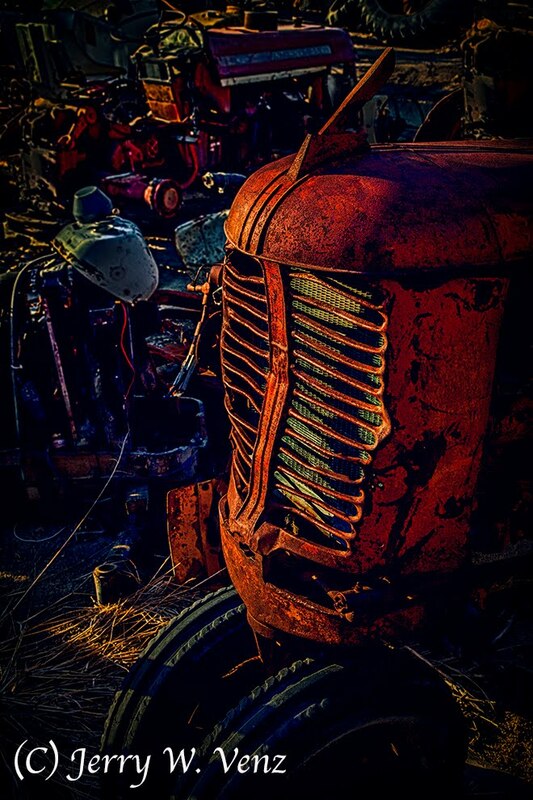 This image illustrates that besides time of day it’s equally important that you move your camera position relative to the subject to create the most dramatic lighting. 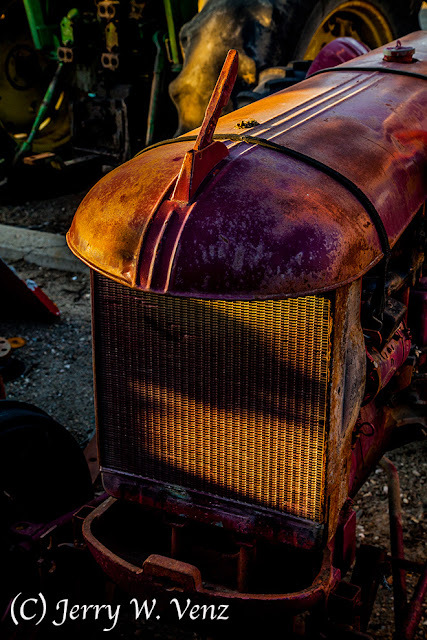 I used a skimming back light here, it really picks-up the texture in this rusted tractor. If I can’t get in a position to get this dramatic light or there is NO Directional Light On My Subject—I Move On. This scene was one that I had earlier walked on by—with a mental note to revisit because it was in direct flat light at the time. I don’t waste my time using flat light with great subjects like these. Watching the sun’s direction of travel I knew this scene would develop nice texture close to sunset. This was one of the last images I did on this location. The sun’s last rays were peaking between a large combine and stacks of tires creating a spot light effect on the “skin” of this small tractor. 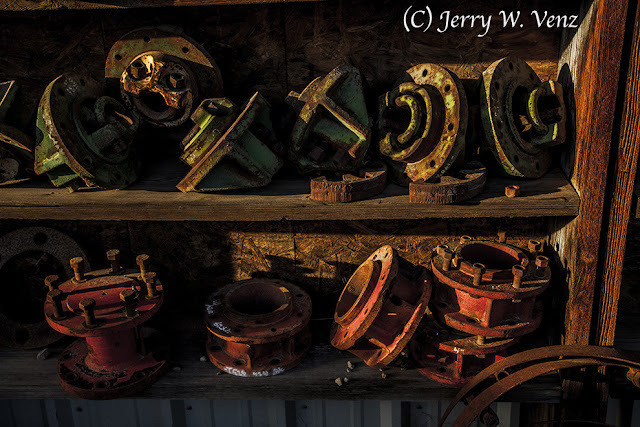 For me this is what photography is all about—using dramatic light to create shape and texture. If I don’t have great light I don’t even take my camera out of it’s bag when I am in total control of the decision.